Root is a Super User in Linux Operating System. Android is a mobile OS based on Linux kernel. Root is the user access rights to the highest lever, as well as Administrator if on Windows Operating System. In the android, the root user is not given to users. This prevents users who do not understand sisitem configuration which can be fatal.Why should Root?Some applications require full access rights (Root) to get into the system and configuration. 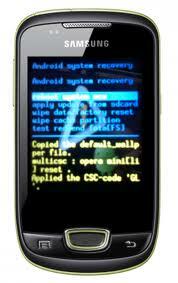 Therefore need to be Root first, so that applications can run smoothly. If only limited use of the ordinary, this is not necessary. But to use that further protection is needed, especially for people who like to research and build.How do I Rooting Android on Galaxy Mini Samsung GT-S5570? follow the steps below:Preparation prior to Root. 1 Keep the battery is fully charged, or at least 50%. 2 Install the driver, can use the application Kies. 1 Download the file update.zip http://www.mediafire.com/?gakbyi443e8p4gz. 2 Copy the file update.zip to sdcard (/ sdcard). 3 Restart Galaxy Mini into Recovery mode. You do this by pressing thePower + Home together until his recovery menu appears. 4 Select Apply update from sd card. Gunkana Volume button to select it, then press the Home button. 5 Select the update.zip file that has been copied to the sdcard. 6 When finished, Reboot your Mini Galaxy again. 7 Galaxy Mini succeed in Root.